This web site was developed as a companion piece to "The Woods in Your Backyard - A Homeowner's Guide." 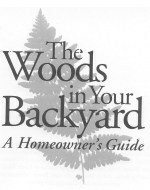 This resource guide was developed by the Maine Forest Service to help you understand the woods in your backyard and give you some ideas about how to work with your property, whether you own a 1/2 acre house lot or ten acres on the edge of town. Each chapter gives an overview of the topic, then provides a Resource List of people, organizations, publications, and web sites that will give you more detailed information on your particular interests. Addresses, telephone numbers and web site addresses are provided when known. Family Projects, included at the end of each chapter, show you how get to know your property as a family and have fun doing it. They can also be adapted by teachers or youth group leaders for instructional use with older students. Maine Forest Service staff is available to provide on-site workshops for topics in "Woods in Your Backyard - A Homeowner's Guide". We hope you enjoy this web site and find the information enjoyable and valuable! Chapter 8. Turning Great Ideas into Action: Planning is the Key! If you were lucky enough to grow up near a patch of woods, you probably remember being so eager to get outside to play that you could barely sit still long enough to finish your breakfast. There were snow forts to build in winter, tree forts to build in summer, and frogs and salamanders to catch in ponds and streams. Whether it was a hundred acres or a vacant lot down the block, the woods were a special place where things change daily. If you were there often enough, its likely you saw ferns uncurling in the spring, fallen trees after a windstorm, squirrel tracks in the snow, and the first song birds back from their winter away. Maybe you missed out on living near the woods as a kid. Don’t worry. The woods in your backyard still offer all that and more. They offer the mystery and adventure children love and the privacy and quiet so often lacking from our busy lives. Depending on your interests and the size of your property, you can create a tranquil woodland flower garden, earn a little income, teach conservation practices to your children, or work with your neighbors to create a community hiking trail. And not only can you have fun doing it, but you don’t have to go anywhere. The woods are right out your back door. This resource guide will help you understand the woods in your backyard and give you some ideas about how to work with your property, whether you own a 1/10 acre house lot or ten acres on the edge of town. Each chapter gives an overview of the topic, then points you to a Resource List of people, organizations, publications, and Web sites that will give you more detailed information on your particular interests. Addresses, telephone numbers and Internet Web site addresses are provided when known. Any listed publication without ordering information can be borrowed through interlibrary loan from your local library or ordered through a bookstore. Family Projects are included at the end of each chapter. The Family Projects show you how get to know your property as a family and have fun doing it. The activities are most suitable for older children and teens, and all require adult supervision. They can also be adapted by teachers or youth group leaders for instructional use with older students. When completed, the family projects also provide a planning framework for work in your woods. Unfamiliar terms that you are likely to see again in other forestry publications are in bold face type in the text and are defined in the Glossary at the back of the guide. The following agencies and organizations often collaborate to provide a wide range of information, services, and training for small landowners. They are good initial contacts for landowners seeking information. They can also direct you to local contacts in your area. Provides information and assistance to landowners on sustainable forestry practices, logging, insects and diseases of forest trees, forest fire prevention and control. Call for the number of the Forest Service field forester in your area. Provides practical, well-researched information on topics ranging from gardening and forestry to family projects and nutrition. Call for a catalog of publications or the number of your local Cooperative Extension Agent. Provides information and assistance to farmers and non-agricultural landowners (including homeowners on house lots) on how to protect soil, water, and the plants, trees, and animals that rely on them. Call for the number of your local office. A non-profit membership organization that encourages sound forest management practices on small properties. Offers informative workshops on a variety of topics including: chainsaw safety techniques, tree identification, managing woodlands for wildlife, and others. Membership not required for attendance. Nine local chapters around the state. Have you ever wondered why trees do what they do? Why does the stately sugar maple out in the yard have a white shelf mushroom growing out of the lower trunk? Will it kill the tree? Is it safe to hang a swing from one of its branches? Why did many of your large balsam fir trees die in the last ten years? Is there anything you should know before planting a weeping willow in the front yard? Fallen trees and dead branches look so messy. Do they have any value? Not all woodlands are alike, but a basic understanding of how the woods grow will give you an idea what activities you can realistically pursue on your own property. Many terms introduced and defined here will come up again in other publications about trees and forests. These terms are also defined in the glossary for easy reference. Plant flowering dogwoods and shadbush to provide food for over twenty species of songbirds. Encourage the growth of white pines, hemlocks and other conifers that provide important food for wintering birds like chickadees, pine siskins, and small mammals like red squirrels and voles. Clear a patch in your woodland for migratory songbirds, deer, ruffed grouse, woodcock and other species that benefit from the vigorous tree growth that occurs after space is opened up. Create or preserve a snag, or a standing dead tree, for the many species of wildlife that use them. Create brush piles that wild turkeys, rabbits, hare, and small mammals use for nesting and hiding. Dig a small pond or pool so wildlife have an accessible water source. Have you ever been pleasantly surprised when you wandered into the woods and found trilliums and woodland lilies growing in the understory? Or felt tensions fade as you cross-country skied through an evergreen forest during the winter? There is increasing scientific evidence that frequent visits to natural areas makes us happier and healthier, even when those visits are brief. A walking trail, woodland flower gardens, or a wildlife viewing point can be developed on less than an acre, so whether quiet beauty or vigorous exercise is your preference, you can create a stress free zone right outside your back door. We tend to think of tropical forests as being the source of many raw materials, and they are, but it might surprise you how much your very own small patch of woods has to offer. Do you build furniture in your workshop, make handicrafts, or make jams and jellies from fresh fruit? If so, the raw materials might be available right out your backdoor. Depending on the type of soil and the trees and plants growing on your property, you may be able to grow or harvest a wide range of woodland products for your own use. In some cases, you can even make money from your woods while balancing other values like wildlife habitat improvement, recreation, and aesthetics. There are so many kinds of renewable products to be harvested from the woods, that it seems limited only by your imagination. What do you need to know about being safe in the woods? The best defense against safety hazards is to know what they are and how to reduce them when you can. The woods in your backyard are remarkably resilient, but they are not immune from damage. Fortunately, you have some control over the ecological health of your little piece of the earth. What you decide to do with your property (or decide not to do) affects it, the land adjacent to it, the water that falls on it and flows over it, and the birds, butterflies, and other animals that rely on it. Even doing nothing has an effect. With a little planning and a little work, you'll see the benefits of your efforts. For example, if you see muddy water in the ditch after a rainstorm this year and you plant bushes and wildflowers to slow the runoff, your reward will be clean flowing water next year. You'll keep your nutrient rich soil in your yard and the whole range of aquatic life in nearby streams will benefit. You'll see the results of your own efforts right out your back door. Are you interested in creating good homes for wildlife or improving your sugar maples with an eye towards making maple syrup? Then you might want to talk to your neighbors. What happens on their property may be a factor in how successful you are in being a good friend to yours. You may even find that you share some of the same values and can work together towards common goals. At the very least, it is worth letting your neighbors know what you are up to, just to keep relations friendly. Your family is important, too. If you spend time improving your property, you will almost certainly become attached to it and want the spirit of stewardship to continue if you decide to sell it or bequeath it to your heirs. Fortunately, there are several options available that may help you reduce property and estate taxes while continuing your approach to land conservation. Some options allow for limited residential construction, agriculture, and forestry. Now you have all these great ideas for your property. How do you go about doing them? If you decide to put an addition on to your house there are several decisions that you need to make. How big will it be? How much can you afford to spend? What will it be used for? Where will the door and windows go? And should you hire a professional to do it or do you have the tools and knowledge to do it yourself? The same process holds true for your woods. If your goals are small and simple like putting in a walking trail or planting a few shrubs to attract wildlife, a few simple tools and the information provided in the recommended resources may be all you need. If you decide to cut some firewood, improve wildlife habitat or put in a cross country ski trail, then a planning document will help improve the health of your woods while you reach your other goals - and possibly even save you time and money. First, you need to decide what you want to do. What are your objectives? Then, determine if those objectives are realistic and affordable. Acadian Cover Type: The spruce-fir and the northern mixed hardwoods forest cover types overlap in the middle of the state and in parts of eastern Maine. This overlap is referred to by many as the Acadian type. Aspen-Birch Cover Type: Usually composed of quaking aspen (which is also known as poplar or popple) and paper birch. Both are pioneer species that invade disturbed areas, but don’t grow well in the shade. Other species, like pin cherry and red maple, often grow with aspen and birch. Azimuth: Measurements, stated in degrees, that are measured clockwise from North on a compass. The largest azimuth is 360 degrees. You can tell the azimuth on a compass by where the numbers on the dial meet the Direction of Travel arrow. Canopy: The ceiling of the woods created by the foliage. Competition: Each individual tree in the woods competes for sunlight, water, nutrients, and growing space. Some will do better than others. Not surprisingly, this phenomenon is called competition. Cover: The place where animals can rest safely. Cover may be a den in a rocky hillside for a red fox, whereas snowshoe hares hide beneath the sheltering branches of evergreen trees and wood frogs find shelter beneath dead leaves on the forest floor. Cover also changes according to season. During the nesting season, many birds need special requirements to raise their young safely. Deciduous: Refers to trees that lose their leaves in the fall. Usually these are broadleaf trees, but some conifers, like tamarack in Maine, turn yellow and lose their needles in the fall. Declination: The needle of a compass points to magnetic north, a highly magnetized area north of Hudson’s Bay. The magnetic north pole lies about 1,300 miles from the geographic (true) North Pole. Depending on where you are on the planet, the difference between Magnetic North and True North varies. The difference between the two is the declination. The declination can be adjusted or compensated for on a compass. Disturbed area: An area that is altered due to natural and human forces. The actual species of trees and plants that grow on a disturbed area are influenced by many factors. Edge: Any place where two different natural areas meet. Whether it is a high tide zone and the adjacent shore, a field edge where it meets the woods, or a stream and stream bank, edges are usually home to many species of plants and animals. Even-aged: Refers to a woodland with trees that are of the same generation and tend to grow older at more or less the same rate, creating a sort of Baby Boom generation. Figured wood: High quality lumber or veneer with unique decorative grain, such as curly maple and birdseye maple. Figured wood can be worth thousands of dollars when quality is high. Forest floor: Home to small woodland flowers and bushes, tree seedlings, small mammals, ground nesting birds, insects, amphibians, and many other kinds of life. Forest covertypes: Cover types are groupings of tree species that tend to grow together under the same conditions. Many tree species may grow together in a cover type, but usually two or three species are most common. Gap: A relatively small opening in the forest canopy created by a tree, or group of trees, that falls or is removed. The gap allows more sunlight into the forest floor. Small trees and seedlings that are moderately shade tolerant and have grown slowly in the shade due to a lack of sunlight, suddenly grow to fill the opening. Habitat: Wildlife need the same basics. (1) food, (2) water, (3) cover, and (4) space. These four components make up the habitat, or living requirements, of each species. Habitat requirements change from season to season for most species. Leaflitter: Decaying wood and leaves, known as leaf litter, are home to earthworms, beetles, and microscopic organisms that recycle rotting material back into nutrient rich soil. Loam: A soil with a fairly even mix of sand, silt, and clay mixed with organic matter. A preferred soil type for many agricultural activities. Management plan: An assessment by a licensed professional forester of a property for timber, wildlife habitat, and other natural features of interest to the landowner. Includes recommendations. Acts as a decision-making guide for landowners. Mast: Trees and shrubs that produce fruit, nuts, or seeds eaten by wildlife. Minerals oil: The underlying soil made up of varying quantities of clay, silt, and sand. Northern Mixed Hardwoods Cover Type: A cover type made up mostly of deciduous tree species that are also known as broad leaf trees or hardwoods. Colorful fall foliage usually indicates that a woodland is made up of mixed hardwoods. Yellow birch, sugar maple, and American beech are the most common species in this cover type. Organics oil: Made up of decomposing leaves and other organic matter as well as small invertebrates and other organisms. Pine-Oak Cover Type: Found in the southern part of Maine, include white pine and red oak and may include red pine and a variety of other oaks that are not usually found in other parts of the state, as well as a variety of other hardwood species. Pioneer species: Sun loving species that grow fast in newly created openings, but have short lives. Pure stands: Can be found in any of the cover types. Sometimes this is a result of planting or thinning; sometimes one tree species naturally dominates the site. Pure stands of red pine, white pine, hemlock, and beech are common in some parts of the state. Riparian area: Edge area between wetlands, streams, pools and adjacent uplands. It is important to more kinds of wildlife than any other habitat type in the state. Shade intolerant: Species that grow well in full sun and don’t grow well in the shade. Tend to be pioneer species. Shade tolerant: Species that grow well in the shade. Tend to be secondary species that follow pioneer species during the process of succession. Silviculture: The practice of forestry management that promotes the health of the woods as a whole, rather than focusing on individual trees. Mimics natural processes of birth, growth and death — and tailors these processes to help achieve landowner goals. Historically, it meant the ability to grow trees faster and more efficiently and cut them for profit without damaging water quality or future trees. These origins led to much of the terminology of forestry that includes terms such as “crop trees” and “timber harvests”. Today, good forestry includes balancing the ecological values with economic concerns. Site: Refers to an area of land and its capacity to grow trees and other vegetation as a function of environmental factors such as climate, soil, drainage, and more. Snag: A standing dead tree, or part of a tree. Snags are important wildlife habitat. They provide homes for 58 species of wildlife in Maine. Soilmaps: Show different kinds of soil in an area. They are available from the Natural Resource Conservation Service (NRCS) can provide a general idea of what to expect from the soil in specific locations. They are accurate from three to five acres. Space: The entire area, or territory, that each animal needs to find food, water, and cover. This varies widely from one species to the next, and also varies seasonally within the same species. Spruce-Fir Cover Type: Forest cover type that primarily consists of red spruce and balsam fir. It is the most common type in northern and eastern Maine. Structure: Woodland structure is made up of gaps, edges, creeks, bogs, and ponds that dry up in late summer, as well as the different heights of trees found in the woods. The structure can be very simple if one species of tree is planted at the same time to cover an area, or it can be complex, with small, medium, and large trees combined with a variety of geographic components like rock outcroppings, wetlands, and streams. Stumpage: The economic value of the standing trees, which varies depending on the species, the condition and size of the tree, and several other factors. Usually refers to the amount a logger will pay for the standing trees “on the stump.” The mill rate (the amount the mill pays) will be higher. Stumpage price reports are available from the Maine Forest Service. Succession: There are two types of succession. Primary Succession occurs on newly formed soils or rock, often after an environmental phenomenon that had eradicated all vegetation and soil. After a volcanic eruption, for example, primary succession would begin in some places. Secondary succession occurs following the removal of part or all of all the original vegetation that grew in a specific place. An old field growing into a woodland is and example of secondary succession. Topographic Map: A map that shows geographic features such as elevation, waterways, forested areas, open areas, towns, and roads. Useful in orienteering, planning, and location of property boundaries. Topsoil: As the organic layer breaks down, it mixes with mineral soil from below to form the nutrient-rich topsoil (the A horizon) beneath the O horizon. Uneven-aged: The woods may have several different ages of trees as a result of wind and ice storms, patchy woodland fires, thinning of trees by property owners, or small clearings created by cutting down trees. A woodland with three different “age classes” is considered uneven-aged. Vernal pools: Woodland vernal pools are created by melting snow and rain in the spring and often dry up by late summer and fall. They vary in size from as small as a mud puddle to many acres in size, provide important spring breeding sites for frogs, toads, salamanders, insects, and small mammals. Some vernal pools are home to rare and protected species. Considered living laboratories by wetlands ecologists, they are also studied for their significance to woodlands as a whole. The files below are PDF files which require the free Adobe Reader . Chapter 5. Safe, Safer, Safest!